I decided to make my own Toothless Card. My son requested a How To Train Your Dragon party for his birthday this year. He got a new blanket with Hiccup and Toothless the other day and just loves his blanket so much. It doesn't hurt that we're listening to the How to Train Your Dragon books on CD and we've seen both the movies. Toothless is an adorable little dragon and ended up being pretty easy to make. Within a day or so I had tons of great party ideas after searching Pinterest for party ideas. But I had no good invitation ideas. Being a card-maker I was NOT going to buy any but I really wanted something that had to do with dragons or eggs or vikings. So I kept looking and looking. I found a few cute dinosaur and monster cards that I thought might work. After playing around for five minutes or so I came up with the most adorable Toothless invitation. Even if I did use some unusual tools to do it. 1. Cut paper to 4 1/4 x 11 and fold in half. 2. 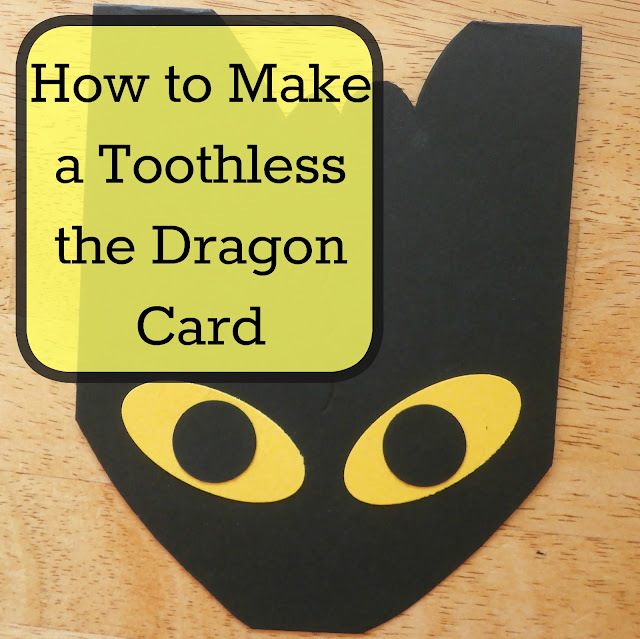 Form the rounded nose of the dragon at the bottom of your card. I ended up looking around for something to trace and believe it or not the perfect shape was my Kitchen Aid Mixer blade! I traced the shape using an embossing stylus pen and then cut along the line with my scissors. 3. Using my large oval punch from Stampin' Up! I cut two yellow eyes and affixed them to the card front fairly close together and at a slight angle. I then punched two black circles using the 3/4" circle punch and used double sided adhesive to affix them to the center of the yellow ovals. 4. At this point I had what looked like a snake and I was stuck for ideas. So I searched for pictures of Toothless and found a few simple drawings and crafts that showed him with his ears and scales. Inspired I drew what looked like a W with an extra point at the top of the card to form the dragon's ears and scales. I then cut them out and asked the kids who I was making. They all knew right away that it was toothless. 5. Finally using my stylus I traced a few bumps and circles between the eyes going up toward the scales/ears for his scales on his face. They don't show up well in the pictures or really even all that well in person but I just felt like I couldn't leave his face plain. very cute. my boys are a bit bigger now but still love How to train your dragon. This is so cute!!! We love how to train your dragon! We were just re-watching the second movie last night; my youngest adores that series. Thank you! I'm not sure I would have thought of that if I wasn't crafting at the kitchen table... but luckily it was right there. That's a great party invitation, it's so much better when we can make things at home instead of buying them! Thank you for sharing at The Really Crafty Link Party this week. Pinned! Thanks, I love personalizing our parties just a bit and making invites and cards is a nice and easy way to do that. Super cute! My daughter will love this!